The youngest sub-branch, R1b-M167, dates to approximately 3.5 kya (95% CI= 2.5-5.3 kya), i.e. even after the Bronze Age. 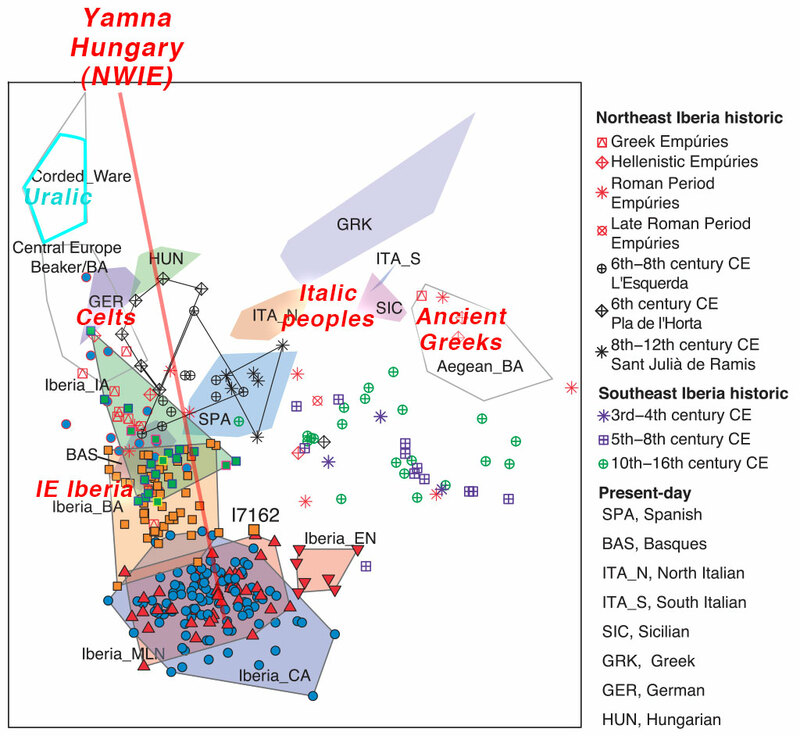 Contour (surface) maps displaying the frequencies of Y-chromosome haplogroup and its sub-lineages across Europe and the Mediterranean basin. Modified from Hernández et al. (2018). NOTE. Admittedly, the maps are mainly based on Iberian samples and certain limited sampling elsewhere, so most of the frequencies displayed in other territories are extrapolated. Since the percentage of R1b-M167 in France is estimated to be ca. 3%, and in Bavaria ca. 5%, the distribution in Central Europe is probably much higher, and around the Mediterranean much lower than represented in them. Several Iberian scholars have referred to stab-and-drag designs in both Bell-Beaker and Bronze Age ceramics (Maluquer de Motes 1956, 180, 196; Fernández-Posse 1982, 137), although these have not always been correctly appraised. In the 1980s it was finally realized that the sherds retrieved at the Boquique Cave should be dated to the Middle-Late Neolithic (4400-3300 BC), and that the same technique was also widely used in the Late Bronze Age (Fernández-Posse 1982, 147-149). 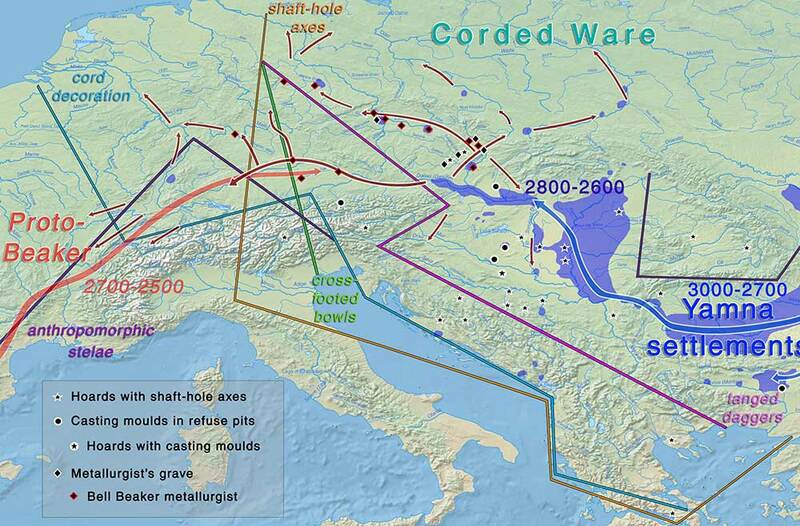 Thus, nowadays it is possible to track this technique in inland Iberia at different moments throughout later prehistory (Alday and Moral 2011, 67). The earliest stab-and-drag motifs (Figure 2.2, 1) are, in fact, older than was initially thought (Fernández-Posse 1982); they actually date to the Early Neolithic (5500-4400 BC), contemporary to the Mediterranean Cardial impressed wares (Alday 2009, 135-137). There are also a few sporadic examples of stab-and-drag motifs among Bell-Beaker pottery (2600-2000 BC), such as the Ciempozuelos-style bowl from Las Carolinas (Madrid) (Figure 2.2, 2a) featuring so-called ‘symbolic’ schematic stags drawn by using this technique (Blasco and Baena 1996, 431, Lám. II; Garrido Pena 2000, 108). It is also possible to recognize this technique in a large Beaker from Molino Sanchón II (Zamora) (Abarquero et al. 2012, 206, fig. 190; Guerra-Doce et al. 2011, 812) (Figure 2.2, 2b) and there are other possible cases (e.g. Montero and Rodríguez 2008, 166, Lám. IX). Finally, the widespread use of this technique occurred in the Late Bronze Age (Figure 2.2, 3a & 3b) from c.1450 BC (e.g. Rodríguez Marcos 2007, 362-364; Abarquero 2005). Several Bell-Beaker styles can be discerned in the Iberian Meseta (e.g. Harrison 1977, 55-67; Garrido Pena 2000; 2014). In this subsection attention will be drawn primarily to the most frequent of these variants, the Ciempozuelos style, although more localised similarities can be recognised between the Beaker impressed-comb style and some early Cogotas I pottery. The Ciempozuelos ware (Delibes 1977; Harrison 1977, 19-20; Blasco 1994; Garrido Pena 2000, 116-126; Rodríguez Marcos 2007, 252-256) was widespread throughout the Meseta between 2600-2000 BC, in the same region subsequently occupied by Cogotas I communities (1800-1150 BC) (Fernández-Posse 1998; Abarquero 2005) (Figure 2.1). There is a wide array of resemblances between both pottery assemblages, a point that has been highlighted since the 1920s (e.g. Almagro Basch 1939, 143-144; Maluquer de Motes 1956, 196; Harrison 1977, 20; Jimeno 1984, 117-118). a) Widespread deployment among the early Cogotas I pottery of the more ubiquitous incised motifs in the Ciempozuelos style: herringbones, spikes and reticulates (Garrido Pena 2000, 119-120, fig. 48, themes 6 and 9; Rodríguez Marcos 2012, 155). During the Middle Bronze Age other less frequent themes are also similar to Bell-Beaker decorations, such as incised triangles filled with lines. 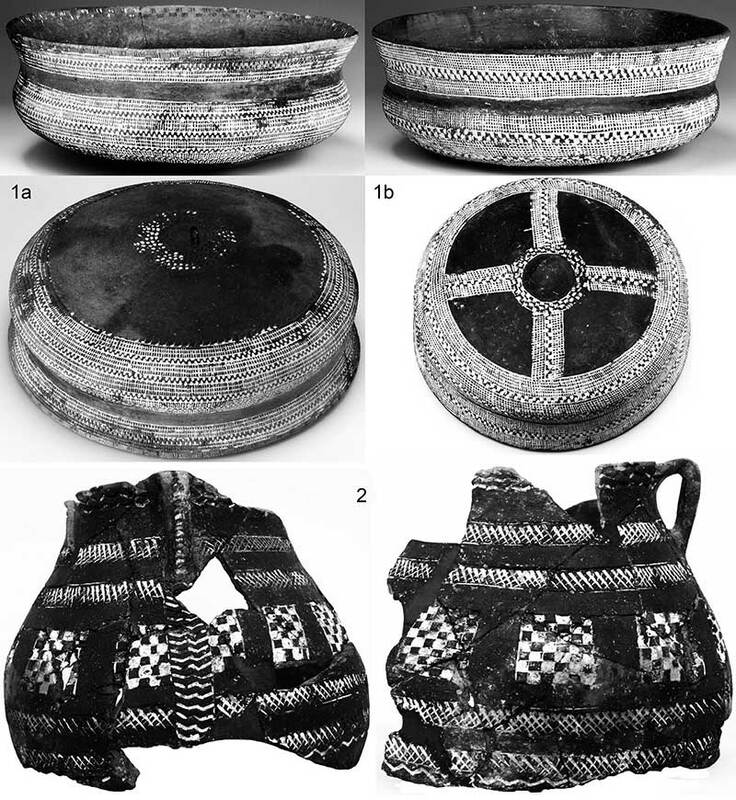 Late Bronze Age wares feature the so-called ‘pseudo-Kerbschnitt’ (Rodríguez Marcos 2007, 369) which has striking precedents among Ciempozuelos ware (Harrison 1977, 20; Garrido Pena 2000, 120, fig. 48, theme 12) (Figure 2.3, 1a & 1b). b) The extensive use of internal rim decoration, almost always deploying chevron motifs. This is ‘a Ciempozuelos leitmotiv’ (Harrison 1977, 20) in the Northern Meseta, where between 30% – 50% of all rims exhibit such a feature (Delibes 1977; Garrido Pena 2000, 163). The decoration of internal rims is even more widespread among Cogotas I vessels (Jimeno 1984; Rodríguez Marcos 2012, 158) (Figure 2.3, 1a). c) White paste rubbed into the geometric decorations (Delibes 1977; Harrison 1977, 20; Jimeno 1984). Maluquer de Motes (1956, 186) in fact regarded excised and stab-and-drag techniques not as decorations per se, but as a way of anchoring encrusted inlays. He also reported that the bulk of rims in Cogotas I vessels exhibit white accretions (Maluquer de Motes 1956, 192) (Figure 2.3). In addition, several authors agree on the likeness between the Bell-Beaker impressed-comb style and certain Cogotas I local pottery variants corresponding to its earliest phase (1800-1450 BC) (Garrido Pena 2000, 113-116). This is particularly striking for one micro-style from the western Meseta region, whose ceramics feature numerous impressed-comb motives (e.g. Fabián 2012; Rodríguez Marcos 2012, 158). 1a) Encrusted Beaker carinated bowls with pseudo-excised motifs from La Salmedina (Madrid) (photo: Museo Arqueológico Regional de Madrid) and 1b) from Cuesta de la Reina (Ciempozuelos, Madrid) (photo: Real Academia de la Historia); 2) Late Bronze Age jar featuring checkerboard excised motives with white paste from Pórragos (Bolaños, Valladolid) (photo: Museo de Valladolid). (…) there are grounds for proffering the view that the key creative mechanism responsible for the resemblances between apparently unrelated pottery assemblages was the emulation of standalone and very apparent decorative traits. It may constitute a good case for horizontal cultural transmission predicated upon iconic resemblances between easily imitated formal traits (Knappett 2010). Instead of spontaneous and autonomous innovations, it is far more compelling to regard these decorative features as interlinked and punctuated ‘way stations along the trails of living beings, moving through a world’ (Ingold and Hallam 2007, 8). No creative act can be regarded as really isolated. Instead it ought to be understood as focusing on the nodes in particular fields of associations (Lohnmann 2010, 216). As we know from Olalde et al. (2018) and Mathieson et al. 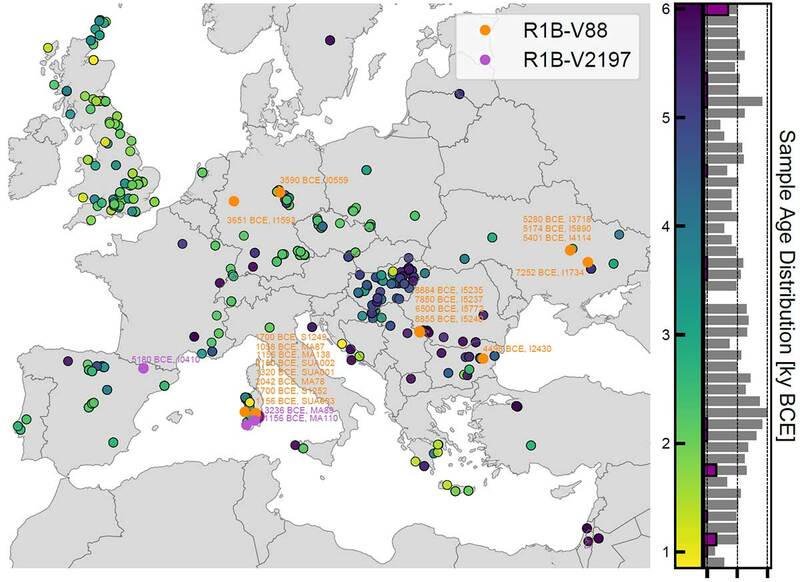 (2018), East Bell Beakers of R1b-L23 subclades and steppe ancestry brought North-West Indo-European languages to Europe, marked in Iberia by the first intrusive Y-DNA R1b-P312 subclades, as supported also by Martiniano et al. (2017) and Valdiosera et al. (2018). 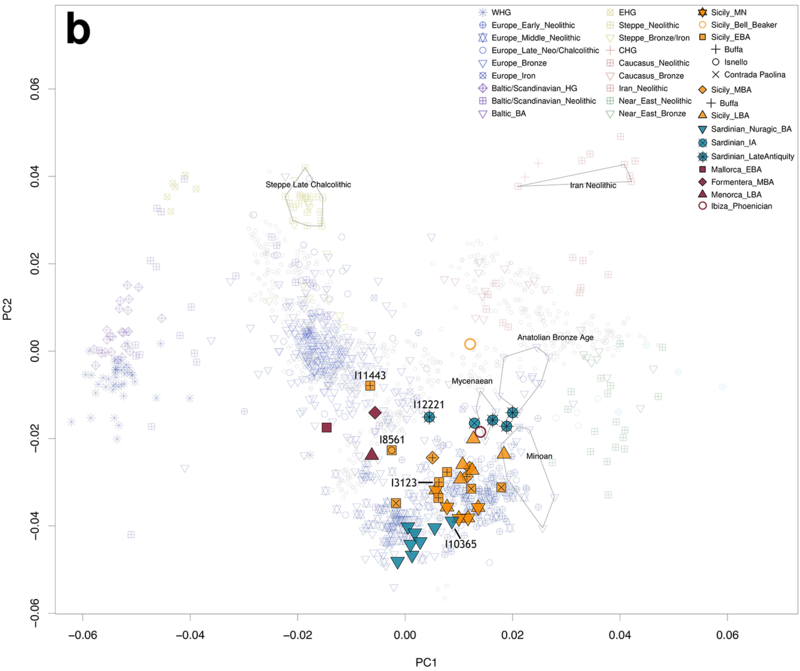 In fact, the Bronze Age Cogotas I culture shows the first R1b-DF27 subclade found to date (R1b-DF27 is prevalent among modern Iberians). 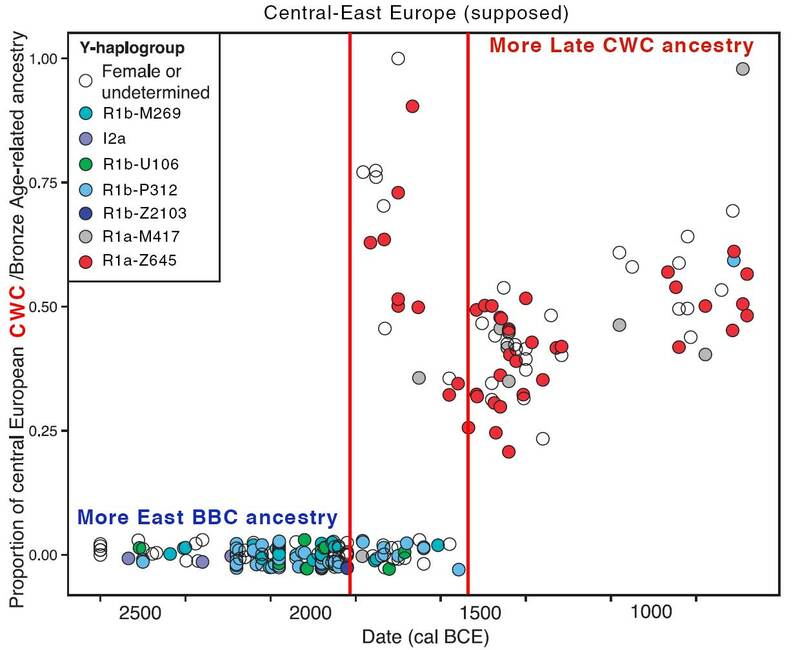 If we take into account that the earliest Iberian Bell Beakers were I2a, R1b-V88, and G2a, just like previous Chalcolithic and Neolithic Iberians, it cannot get clearer how and when the first Indo-European waves reached Iberia, and thus that the Harrison and Heyd (2007) model of East Bell Beaker expansion was right. 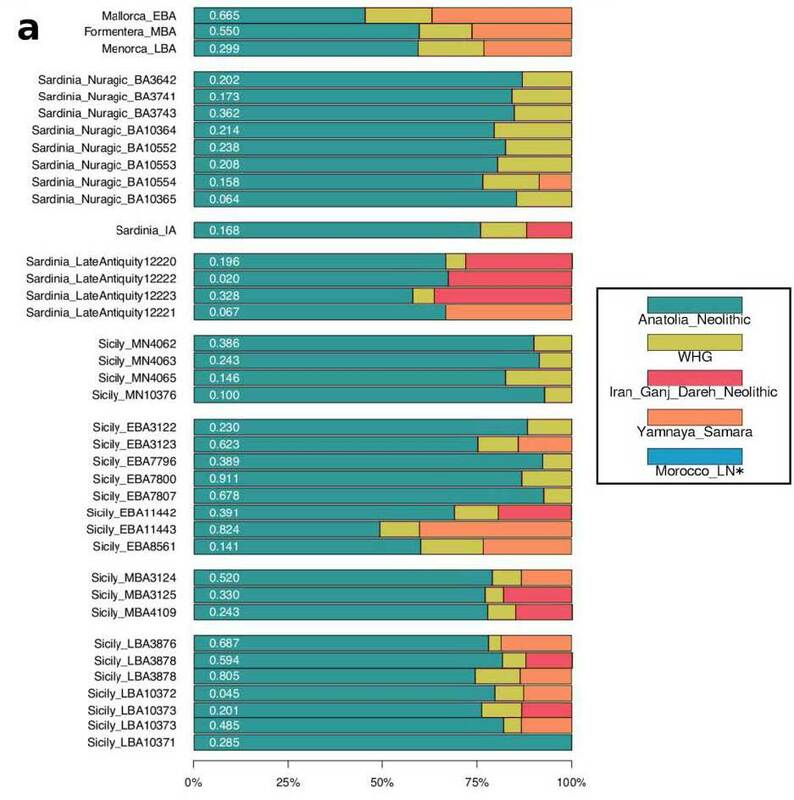 Not a single reputable geneticist contests the origin of R1b-L23 subclades in Iberia anymore (see e.g. Heyd, or Lazaridis). 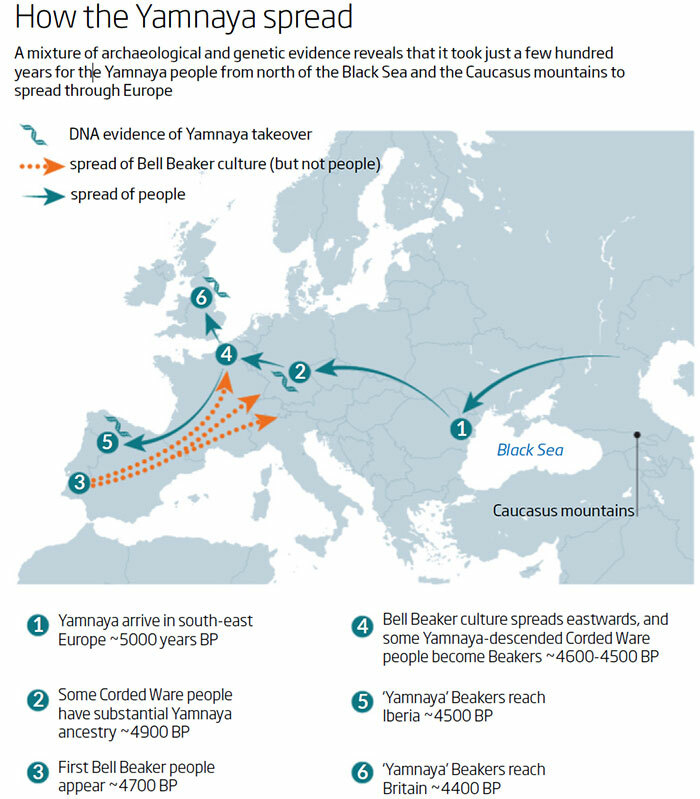 While the Spanish archaeological school will be slow to adapt to genetic finds – since there are many scholars who have supported for years other ways of expansion of the different Bell Beaker motifs, and follow mostly the “pots not people” descriptive Archaeology – , many works like these can be just as well reinterpreted in light of what we already know happened in terms of population movements during this period, and this alone gives a whole new interesting perspective to archaeological finds. Stable isotope ratio analysis of bone collagen as indicator of different dietary habits and environmental conditions in northeastern Iberia during the 4th and 3rd millennium cal B.C., by Villalba-Mouco et al. Archaeol Anthropol Sci (2018). 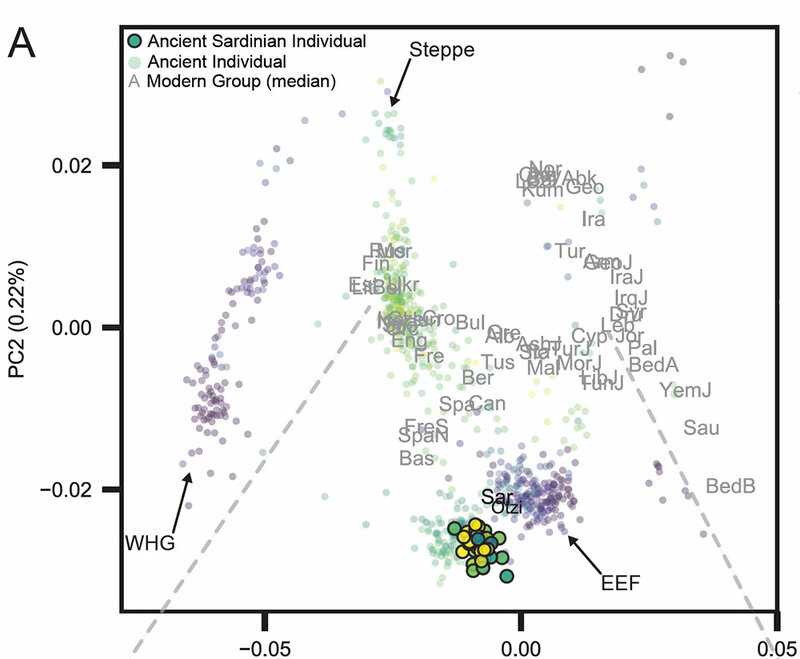 Scatter plot of human and fauna bone collagen δ13C and δ15N values from Cueva de Abauntz (above) and Cova de la Guineu (below). 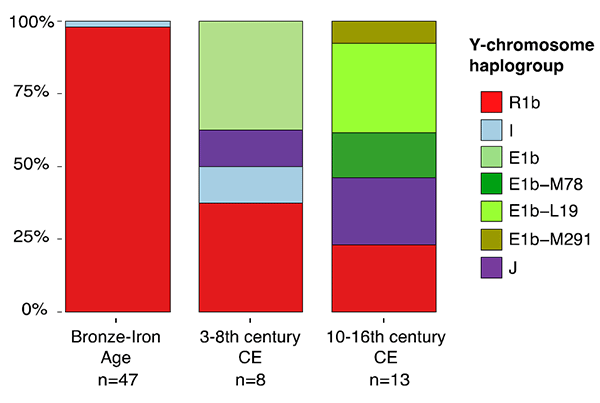 The human isotope values from both sites portray a quite homogeneous overall diet among humans. 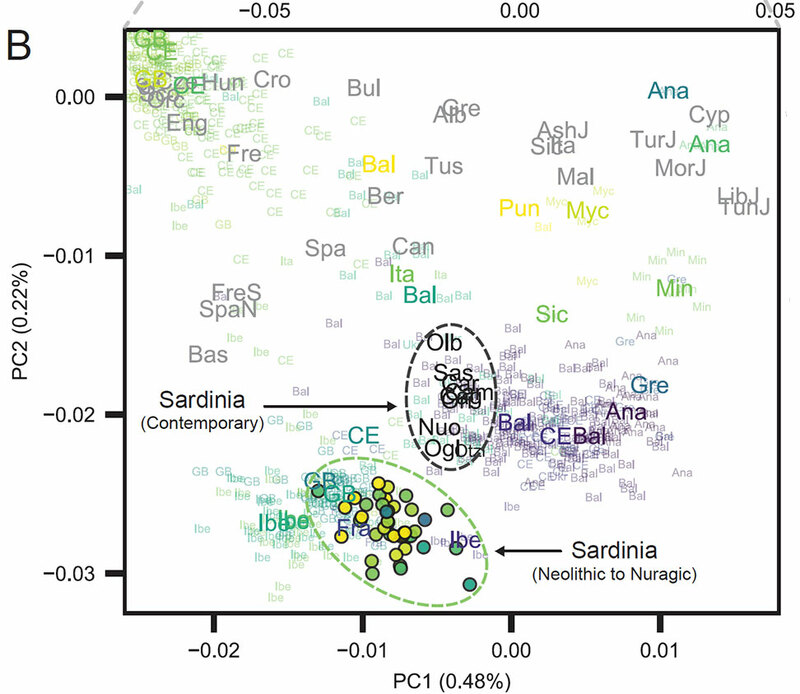 This homogeneous pattern of diet based on C3 terrestrial resources seems to be general along the entire Iberian Peninsula during the Late Neolithic and Chalcolithic (e.g. 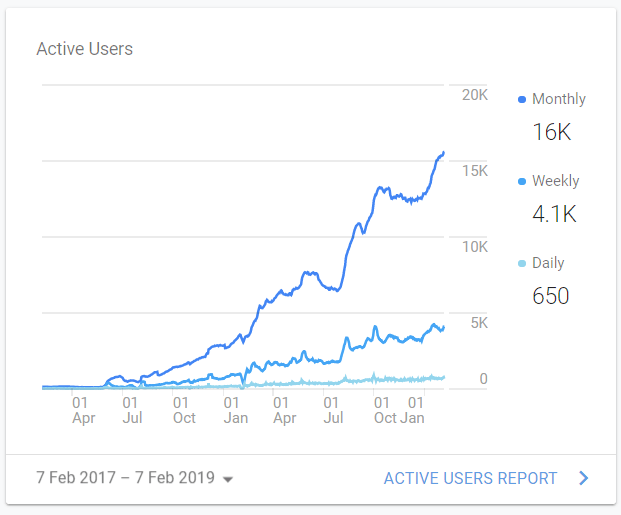 Alt et al. 2016; Díaz-Zorita 2014; Fernández-Crespo et al. 2016; Fontanals-Coll et al. 2015; García-Borja et al. 2013; López-Costas et al. 2015; McClure et al. 2011; Sarasketa-Gartzia et al. 2017; Villalba- Mouco et al. 2017; Salazar-García 2011; Salazar-García et al. 2013b; Salazar-García 2014; Waterman et al. 2016). The reason of this homogeneity could be the consolidated economy based on agriculture and livestock, together with a higher mobility among the different communities and the increase of trade networks, not only in prestigious objects (Schuhmacher and Banerjee 2012) but also in food products. 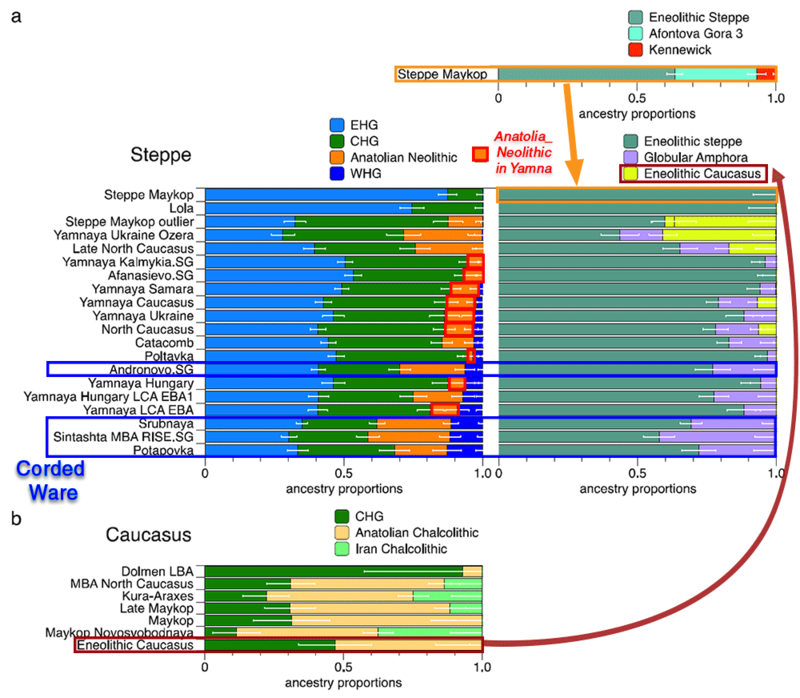 Isotopic analyses in fauna remains could give us more clues about animal trade, as happens in other chronologies (Salazar- García et al. 2017). 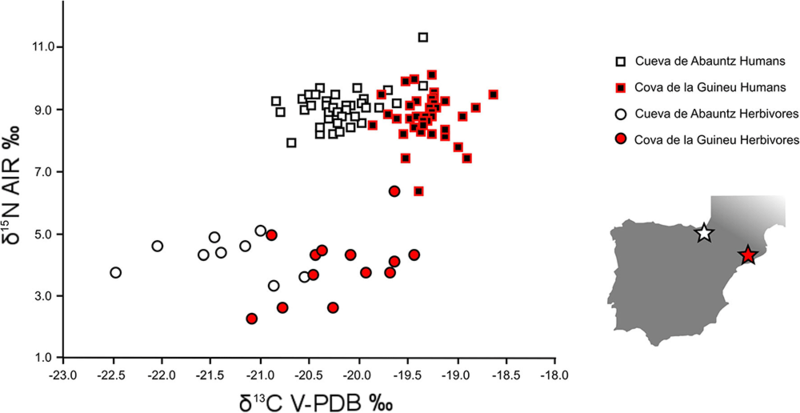 In any case, and even if the dietary interpretation does not vary, it is noteworthy to mention that there are significant differences between δ13C human values from Cova de la Guineu and δ13C human values from Cueva de Abauntz (Mann-Whitney test, p = 1.05× 10−12) (Fig. 6). 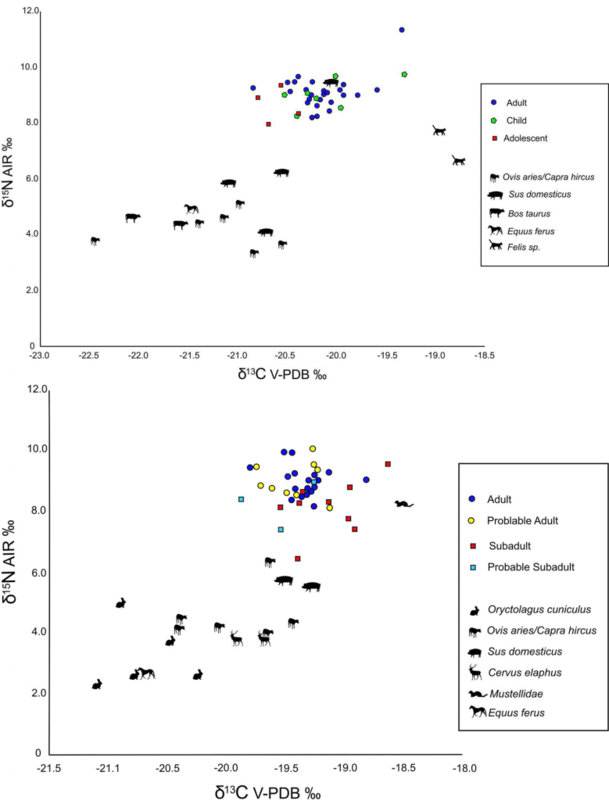 This observed δ13C differences among humans is also present among herbivores (Mann-Whitney test, p = 0.0004), which define the baseline of each ecosystem. 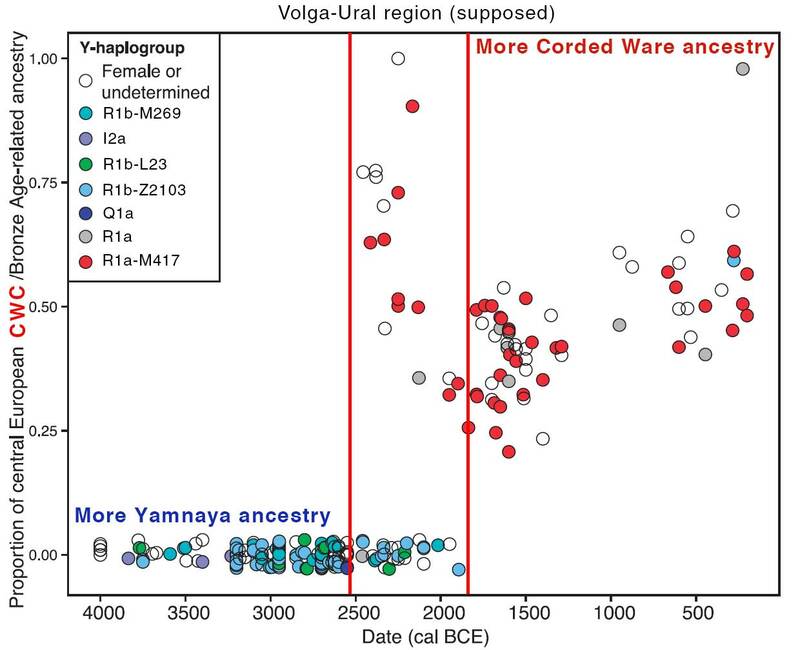 This suggests that the observed human difference between sites should not be attributed to diet, but most possibly to the existence of enough environmental differences to be recorded in the collagen δ13C values along the food web. Plants are very sensitive to different environmental factors (altitude, temperature, luminosity or water availability) and their physiological adaptation to its factors can generate a variation in their isotopic values as happens with C3 and C4 adaptations (O’Leary 1981; Ambrose 1991). This spectrum of values has been used to assess several aspects about past environmental conditions when studying the δ13C and δ15N isotopic values of a species with a fixed diet over time (e.g. Stevens et al. 2008; González-Guarda et al. 2017). Moreover, this gradual δ13C and δ15N variation among different environments is very helpful to discriminate altitudinal movements in herbivores with a high precision method based on serial dentine analysis (Tornero et al. 2016b). In our case, results reflect the influence of environment from at least two areas in Iberia (the Western Prepyrenees and the Northeastern coast of Iberia). These differences demand caution when interpreting human diets from different sites that are not contemporary and/or not in a same area, as it is possible that the environmental influence is responsible for changes otherwise attributed to different subsistence patterns and social structures (Fernández-Crespo and Schulting 2017), as has been demonstrated in neighbouring territories (Herrscher and Bras-Goude 2010; Goude and Fontugne 2016).